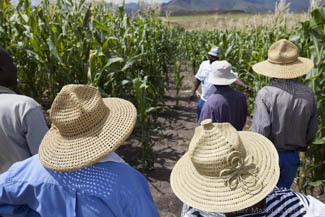 The 10 ha Demonstration Farm at Maphutseng allows Growing Nations to showcase what can be achieved using Farming God's Way Conservation Agriculture methods in Lesotho. Many people believe that there is no hope for farming in Lesotho but the demo farm shows otherwise. The site provides a place where farmers can see for themselves the different methods that can be used and the different crops that can be grown. It is also where they can be taught practically about the principles of Conservation Agriculture. The farm also provides dedicated fields for the students from our Resident Student Program to get hands on experience and put into practice what they have been taught. The fields are planted with a variety of different crops, including maize, sorghum, soya beans, pinto beans, cabbage, tomatoes, beetroot, carrots, swiss chard, kale & turnips. Fodder is also grown for animals on some fields, including fodder sorghum & lucerne, to demonstrate how Conservation Agriculture can also provide fodder for animals and reduce the need for grazing crop residues, one of the major contributors to soil erosion in Lesotho. 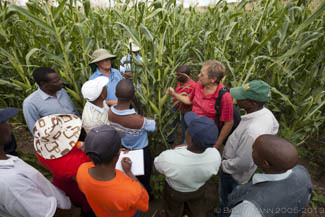 Growing Nations is used as a training facility by NGO's and provides training for farmer groups from across Lesotho. Visitors regularly come from across Africa to learn about Conservation Agriculture with a view to implementing the methods back in their own countries and communities. 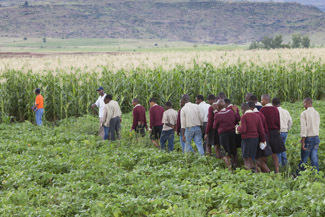 Over the last 10 years Growing Nations has been working with the University of Tennessee & the National University of Lesotho to carry out research into Conservation Agriculture at Maphutseng. This has included research into optimum plant populations, planting times, fertiliser application rates, the impact of cover crops, measuring carbon sequestration, the impact of different crop varieties and the effect of ploughing. Research has also taken place funded by other organisations into intercropping with different plants (e.g. 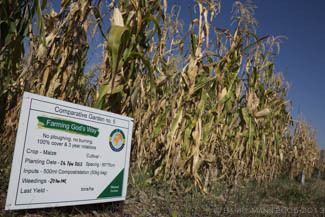 maize/beans, maize/sunhemp, maize/pumpkin, etc.) & grazing studies to see the impact of grazing on green manure cover crops. 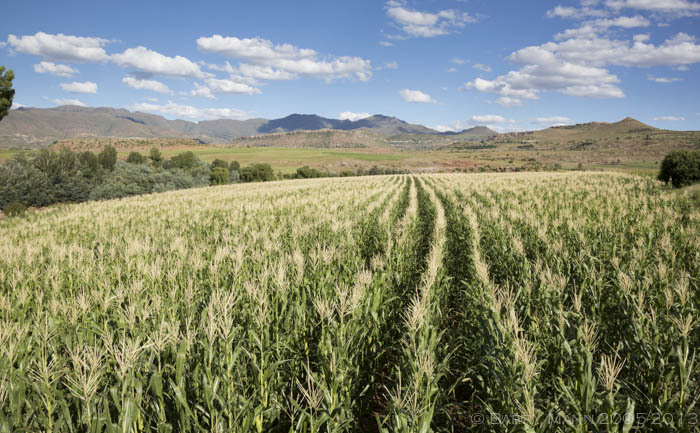 The fields at Maphutseng regularly produce yields of maize between 3 & 10 tons/ha, compared to a country average of 0.4-0.7 t/ha. A great testiment to what can be achieved in a country where the latest (2012-13) figures say that 725,000 people (39% of the population) are food insecure & reliant on food aid. In an effort to help the farm & Growing Nations as a whole to become more self sufficient trails of seed production started in 2016/17. Certified seed was successfully produced and sold and more can be read about how that was achieved on the Agri-business page on the site.